This is an article on the ARACCMA blog. It describes 80M AM transmitter receiver with S9plus kits. 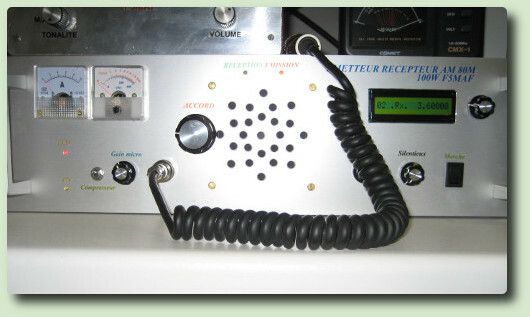 We have a regular QSO on 3.600 KHz, ARACCMA blog presente associative menbers and their material and technical articles. Worked well, but was just a bench experiment at the time. Had a few conversations with it, then it went in a box. Wish I could read the blog. My transmitter delivre 100W (43V) carrier and over 400W peak with 47V (350W PSU). vous pouvez améliorer l'efficacité de 90% à 96% par le remplacement de la T-200 et T-157 bobines à noyau d'air. J'effectuerai un test avec la self du filtre en L.
I can read clearly your blog. i m using Chrome browser, and translate it to english. Thanks for valuable info friend.